Who would argue with a pain-free injection? Nobody loves the thought of a needle piercing their skin, least of all doctors and dentists who have to deal with stressed and anxious patients. Scientists have been working on this problem for a while, but a young British inventor based in Somerset may have come up with the solution. Oliver Blackwell's device looks like the typical cannulas used in hospitals and doctors' surgeries around the country, with one crucial difference. On the front is a much smaller needle which injects a tiny amount of local anaesthetic to ease the pain of the larger needle which follows. It is essentially two injections in one - the first one, virtually pain-free, paving the way for the second one, which is rendered painless. The first injection is "like a fly landing on your palm", the inventor says. 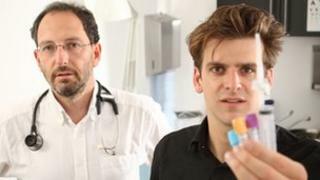 Blackwell, who is 29 and graduated in industrial design from the University of Plymouth, UK, in 2005, says his pain-free needle could be used in millions of procedures every year and reduce the risk of contamination or confusion because staff will only have to deal with one device. "At the moment, if they want to use a local anaesthetic they have to use two needles, find keys and go to the medicine cupboard separately and it all takes time and effort," he says. He involved experts in his design, enrolling the help of two family doctors and a former president of The Royal College of Anaesthetists. They insisted that it should be easy to use, feel and look familiar and meet the needs of patients and doctors. Dr Alan McGlennan, lead obstetric anaesthetist at the Royal Free Hospital in London, said the idea of a pain-free needle had value. "Nobody likes having injections, but in my line of work it tends to end up with a needle somewhere." He meets at least one adult every week who is so anxious about needles that their blood pressure rises. Children aged between three and 12 are also particularly prone to needle phobia, he says. Nobody likes having injections, but in my line of work it tends to end up with a needle somewhere. "But so much of it is perception rather than reality. For many people it's psychological." Dr McGlennan has sometimes used a local anaesthetic paste on patients' arms which numbs the skin prior to an injection. This eases the pain, but the needle still has to penetrate the skin. Perhaps, in the future, there will be a way of avoiding needles altogether. American scientists have tested a vaccine patch on mice, which cuts out the need for painful needles. Instead, the patch has hundreds of microscopic needles which dissolve into the skin. The researchers say that one day it could be used to enable people to vaccinate themselves against flu, for example. Several years ago, Japanese scientists claimed they had developed a tiny hypodermic syringe that could be used to give virtually pain-free injections. This could be very good news for people with conditions like diabetes, who require daily injections of insulin to manage their condition. A needle-free injecting device is available on prescription in the UK, says charity Diabetes UK. The insujet insulin administration system is intended for people who are uncomfortable injecting themselves with a needle. When administered, the insulin passes through a small channel, creating a high speed jet that can penetrate the skin and underlying tissue. "Combined with a unique automatic injection system, this results in virtually painless insulin administration," the charity's spokesman Richard Evans explains. Blackwell's device has been through extensive testing but there are still more trials to come before it can be mass-produced. He has won design awards before and is currently working on a range of different inventions - from agricultural machinery to electrical products and medical devices. "It is all about gaining an insight. You take simple information on board from the experts and adapt your thinking based on their skills." Millions of people will be hoping he gets it right.